Published: Dec. 12, 2012 at 12:35 p.m. Updated: Dec. 12, 2012 at 07:32 p.m.
Kevin Kolb's lost season with the Arizona Cardinals is over. His Cardinals career probably is done, too. 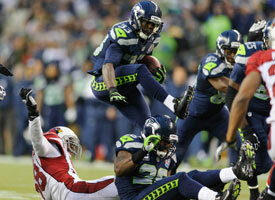 Check out the best photos from the Week 14 matchup between the Cardinals and Seahawks. The team announced Wednesday that Kolb was placed on season-ending injured reserve. He showed flashes of promise in six outings this year (five starts), helping the Cardinals get off to a 4-2 record. The Cardinals believed Kolb would be able to return this season, but he recently experienced a setback in his recovery from a rib injury. The Cardinals' utter collapse after Kolb's injury actually might help his free-agent value this offseason. His 6.4 yards per attempt and 8 to 3 touchdown-to-interception ratio looks positively Montana-like compared to what John Skelton and Ryan Lindley have mustered. Still, it's hard to imagine Kolb returning to the Cardinals. Kolb hasn't been able to stay healthy since the Cardinals signed him to a massive contract after trading draft picks and cornerback Dominique-Rodgers Cromartie to the Philadelphia Eagles for him in 2011. Kolb is due $11 million next season, including a $2 million roster bonus in March. There's no way the Cardinals will pay Kolb that salary. He very likely will be looking for a job in free agency for the first time. His coach, Ken Whisenhunt, might be on the market, too. UPDATE: Kolb said he wants to know early this offseason where he stands with the Cardinals. "I would like for it to be settled for my sake and my family's sake," Kolb said, via The Associated Press. "It's been a hot topic for about three offseasons in a row. Hopefully, we'll have some conversations and, like I said, I made a commitment to this team. I want to be around for a long time. I'd like to do very big things here, and I have confidence in what we have here."